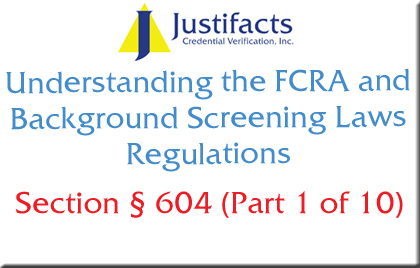 As with any law, the FCRA is a difficult read and contains much technical jargon. Over a ten-part series, Justifacts will be discussing the specific sections of the FCRA that are appropriate to background reports used for employment purposes. ii. to review an account to determine whether the consumer continues to meet the terms of the account. b. the consumer reporting agency provides with the report or has previously provided, a summary of the consumer’s rights under this title, as prescribed by the Bureau under section 609.
b. the consumer has authorized in writing the procurement of the report by that person. b. a description in writing of the rights of the consumer under this title, as prescribed by the Bureau under section 609. 3. Information from the report will not be used in violation of any applicable Federal or State equal employment opportunity law or regulation.